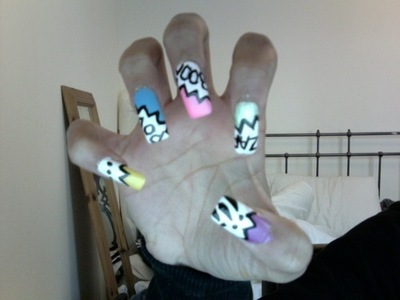 I came across this picture from the homie Blogxilla over in Xilla land where he featured different nail designs from a hwat designer that goes by the name of "ProNail$". She has created over ten different nail art creations this week that feature's Rihanna's "Rude boy", "YSL nails", and this design "ZapBoomPow" that is featured on my blog. Go over to her site and check out her designs.